Industrial EDDY Sludge Pumps features a robust design and no critical tolerances which are ideal for dredging, pumping high viscosity material, sludge, muck, paste, and other high solids pumping applications. EDDY Pump industrial sludge pumps are non-clogging pumps designed for efficiently pumping industrial sludge and related applications. Our patented pump technology outperforms all centrifugal, vortex and positive displacement pumps in a variety of the most difficult pumping applications. Main Applications: Mining, Dredging, Wastewater, Chemical, Paste, Oil, Sludge, Sand, Mud, Paper/Pulp, and more. The EDDY Pump’s adjustable size and ultra recessed rotor can pass the largest material in the industry. In harsh conditions with sand, sludge, rocks, and sludge, normal dredge pumps clog, wear and fail more often. This leads to downtime for maintenance, hurting your bottom line. This is not the case with EDDY Pumps, since we have the tolerance to pump solid objects up to 9 inches without damaging the pump! Pass solids from 1-9 inches (rocks, rags, debris). 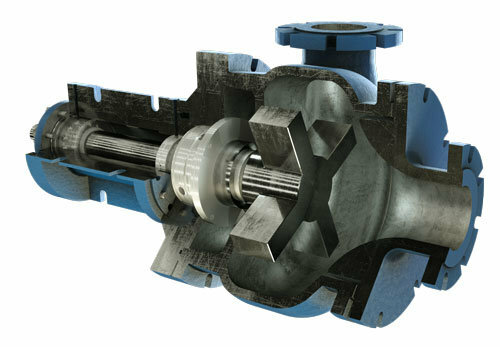 The EDDY Pump’s open rotor design with high tolerances allow anything that will go into the pump’s intake to be passed through the discharge without issues. The tolerance between the rotor and the volute in the 4″ EDDY Pump easily allows the passage of a man’s arm (*see picture below). Compared with the tolerance in a centrifugal pump, the EDDY Pump easily wins. Over the span of our 2-inch through 10-inch EDDY Pump line, the tolerance ranges from 1-9 inches. This translates to a significant amount of solids and debris pass through, without clogging the pump. To learn more about the technology behind our pumps continue reading Here. The EDDY High Solids Pump Makes Slurry and Mud Move Like Water. The Ideal Pump for Sludge, Muck, Grit, Fly Ash, Paste and Scum. With flooded suction pumps, the sludge to be pumped is positioned above the pump. With the pump positioned below, gravity can feed the sludge or fluid into the suction of the pump which keeps the pump primed. With a self-priming unit, the pump and power unit are not submerged. The suction house goes into the slurry and the unit acts like a super-sized wet dry vacuum. Can be trailer mounted for added mobility. The Best Non-Clog and High Solids Sludge Pump on the Market. Since 1984. Best Applications: If you are pumping sludge, high solids, extremely viscous material, paste, high abrasives (sand & gravel), and material filled with solids, then you found the ideal pump for your job. Call Us for quotes on purchasing or renting. Industries Most Served: Mining, Dredging, Fly Ash, Coal Ash Pumping, Oil and Fracking, Waste Water, Paper/Pulp, Chemical, Energy, Water Districts, and Irrigation Districts. Fully assembled sludge pump easily lets an arm pass through. Rags, 1-9 inch rocks and debris can easily pass through an EDDY pump.